News and Reports from Sivananda Ashram Ahmedabad. July the month of holy Sri Guru Purnima and Sri Mahasamadhi Aaradhana day of most worshipful and revered Sadgurudev H. H. Sri Swami Sivanandaji Maharaj were celebrated at Sivananda Ashram Ahmedabad in blissful and serene atmosphere. Commencing with Jay Ganesh, Guru Stotras, Shanti Path and devotional music and singing in all praise of Sri Gurudev by Smt. Mayurikaben Oza was the highlight of the program. Most respected and revered Dr. M.J. Patni Saheb (trustee and Ex. 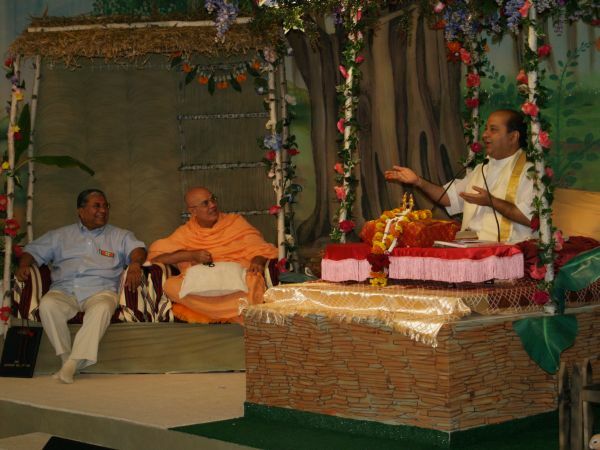 Acting President of the ashram) conducted the Paduka Pujan. Devotees came from all over joined in this holy satsang and Mahaprasad was served to one and all. About six hundred and thirty devotees were served mahaprasad of Sri Guru Purnima Festival. Daily Yogasana teachings to beginners and advanced yoga students, medical consultations, Yoga counseling, grocery distribution to the needy and poor senior citizens, healthy food distribution to under privileged children's of city were carried this months also. Day long chanting of Mrityunjaya Mantra on Sunday, Paduka Pujan on Thursday and a daily satsang at night were the regular activities of the ashram during the month. These are the thoughts Sri. 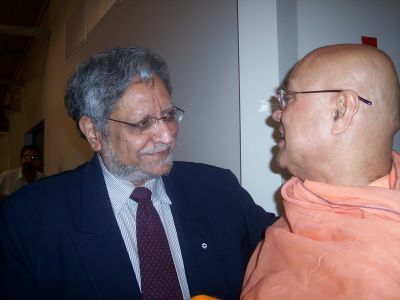 Swami Adhyatmanandaji shared about Yoga and the Mission of His "Divya Tour 2006 " at the interview with Sri. Laxmana Rao, a journalist of leading newspaper “India Tribune”of Chicago. 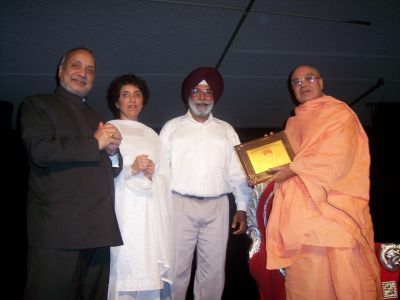 On July17,2006 Sri Swamiji spoke at evening satsang upon the subject "Continuing our rich Hindu tradition to future generations". On July 18th Sri Swamiji Maharaj conducted group Sri Satya Narayan Pooja.